So...Maybe I was a bit overdramatic yesterday...haha! I got out all the hate I have for the mystic eggs and even threw in a few jabs at the walking coconut tree...Let's get right into the work, shall we? So Exeggutor, not counting my hate, isn't really the most interesting visual design I've had the pleasure of coming across. For me, evolutions should be coherent to the ground work laid by the first stage creature. 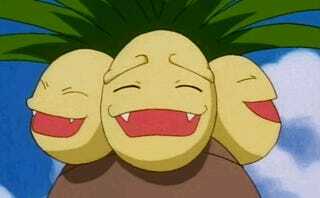 Exeggutor seemed to sprint past any details of Exeggcute minus multiple heads and move into his own territory. My artwork and concept tries its best to give a few nods to Exeggcute and its unusual typing. I played with a lot of art styles and approaches, and you can see how varied they all got. The first one I went with was a parody of the cover to the all time classic "The Giving Tree" and I was really intent on doing that, but I decided I wanted to avoid parodies unless they absolutely are the best option. It's important that I continue to explore my artistic capabilities and push boundaries in terms of style. What I ended up with is a work that combines multiple textures and forms both free and controlled. 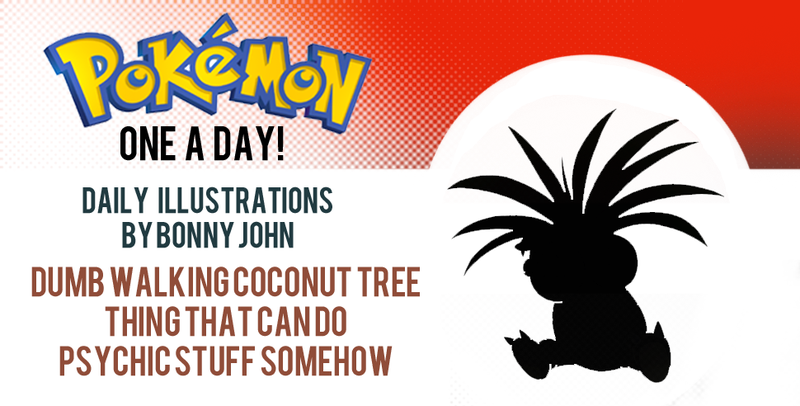 What I mean by free and controlled are the fact that the "hair" or the branches and leaves are without outline and free while the body of Exeggutor is marked by black and cements it further in place. What this does is give weight to the body, which makes sense since we're talking about the trunk of a tree, and leaves the greenery to be free and flowy by not restricting it to outlines. This is a subtle detail that lets the piece breathe and contain itself at the same time. The overall style has should create a sense of twisted whimsical cartooning,with a slight brush of realism thanks to some rendering with light and shadow. I painted the whole work with a solid wed brush for a majority of the time, only using a dry textured brush to add some flair to the greens of the branches and leaves as well as grain for the wood body via blending and marking the panel of the bark. The heads have a unique approach in that I tried to feature the coconuts of the original as the pink eggs of its first form, and that when cracked reveals eyes that give it perfect visibility. I made the eyes purple to jive with the psychic nature of the Pokemon, and added several more eyes to the openings in between the wood to add a certain level of creepiness to the creature. Actually, speaking of creepy, I was trying to add actual humanoid faces for a few of the designs including this one, in homage to the Jinmenju that Exeggutor is based off of (look him up, creepy cool Yokai myth) and then decided to go a bit more abstract. By having only one mouth to laugh out of and having the rest of the coconut/egg/heads have individual eyes, I get to have a creepy design that also gives great vision to a creature as slowmoving as a tree. Ta-da! Hope you like the work and enjoyed the thought process behind it! You can see I really tried my best to give this Pokemon I hate a make over after seeing how many routes I could plan before deciding to give the right one a shot....I kinda like Exeggutor a little bit more now. Only a little ;) See you tomorrow!